The Slingshot Soft Harness is designed to be worn with the Model D, Model D Sport, or the Model A STP packers. It is not designed for use with traditional dildos, and it is not designed for sexual use. This is an updated design since the original Model D Harness (Model D Slingshot Harness). Made with thick and plush high quality elastic. The Soft Slingshot is completely washer and dryer safe. With no waist band, this harness stays in place with two elastic thigh straps. The elastic has a great stretch and is designed to fit snugly. Sizing options are based on waist size, in inches, but there is no strap that goes around your waist. 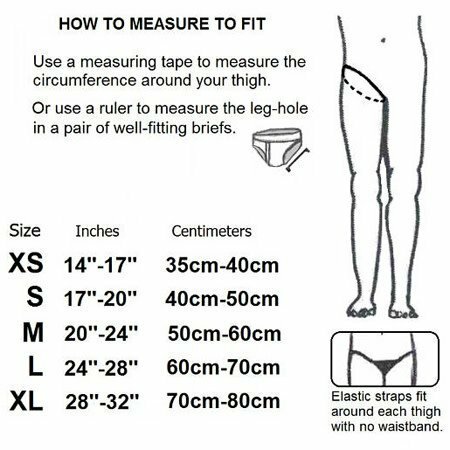 See the sizing guide image above for actual thigh measurements! XS: approx. waist 24"-28" Small: approx. waist 28"-32" Medium: approx. waist 32"-36" Large: approx. waist 36"-42" XL: approx. waist 42"-48"
Due to the intimate nature of this item, it is non-returnable. Please choose your size carefully, as exchanges will not be made based on size. This is the harness only; does not include soft packer. The Model D STP packer is shown in the photo for illustration purposes only.